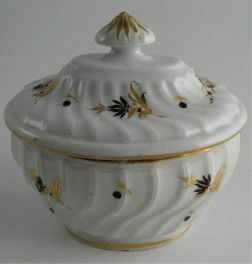 An attractive Chamberlain Worcester shanked oval sucrier and cover, dating from c1795. 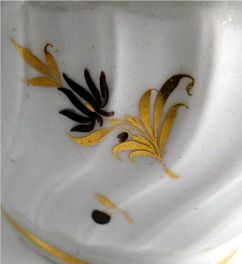 The body is decorated in pattern number 16, which includes gilt and brown floral sprigs. 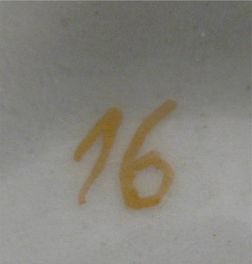 The sucrier is marked with 'Chamberlains Warranted No16' in black on the underside of the cover and the pattern number '16' in gilt on the underside of the sucrier. 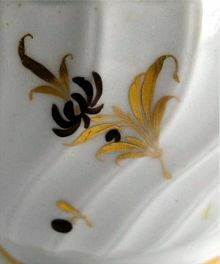 In Chamberlain's pattern book, this pattern is listed as 'plain, rose colour & gold sprigs. 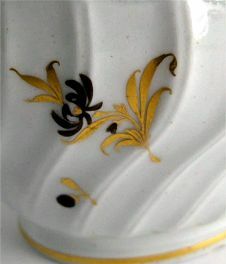 Mr H C's pattern'. 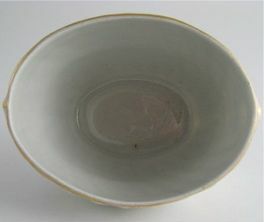 The body of the sucrier has a beautiful oval and waisted shape. 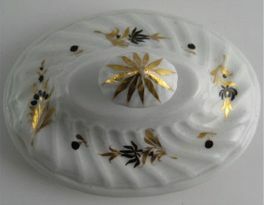 The body is moulded with spiral lines that are known as a shanked moulded body. 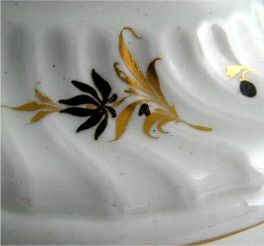 Each of the spiral lines has a double line to it, referred to as 'tram line' and is a feature of the Chamberlain's Worcester manufacture. 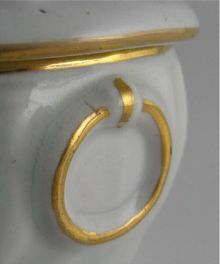 At each end of the sucrier is a moulded and gilded loop handle. 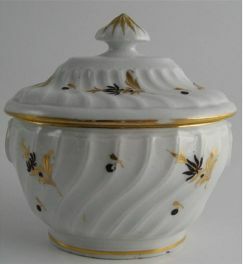 The body of the sucrier is decorated in formally placed brown and gilt floral sprigs. 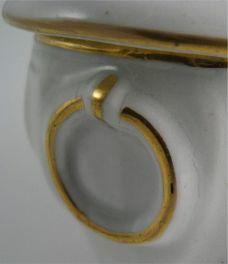 At each end of the sucrier are moulded and gilded circular drop loop handles. 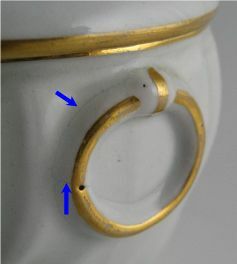 The sucrier sits upon a raised oval foot with a gilt line running around the outside. 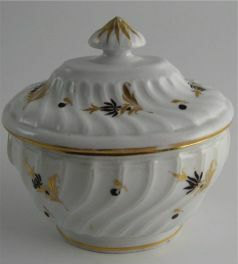 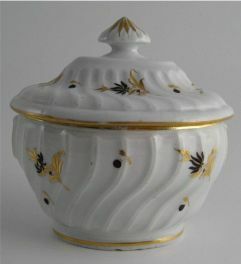 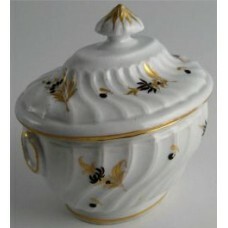 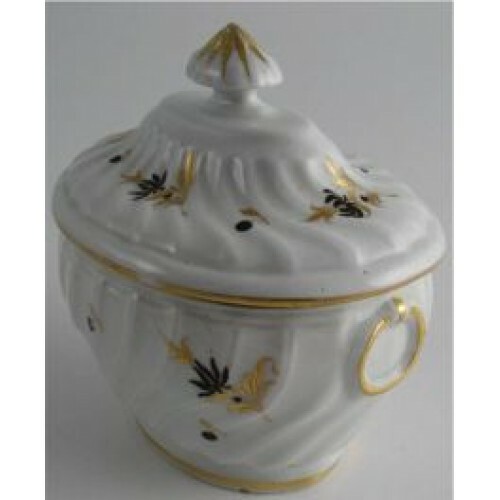 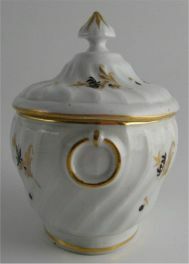 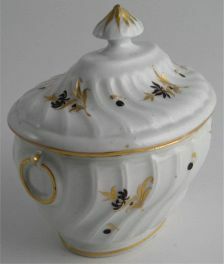 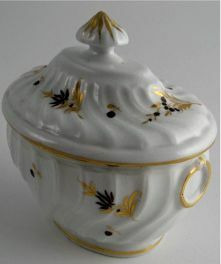 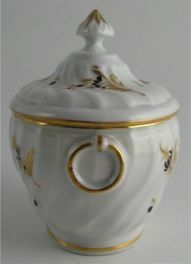 The oval shanked lid of the sucrier is decorated in the same way as the sucrier itself with brown and gilt floral decoration. 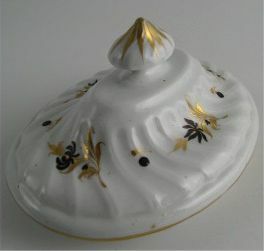 The cover has a typical flat oval mushroom shaped finial, this having spiral mouldings to the top portion and embellished with gilded lines. 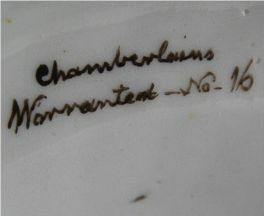 The inside of the cover is marked with the Chamberlain's Worcester mark. 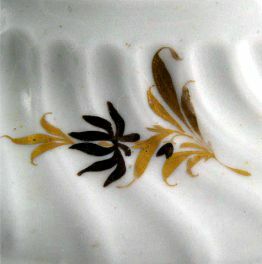 A most charming Chamberlain Worcester oval shanked Sucrier and Cover, having an attractive brown and gilt floral decoration, Pattern Number 16, c1795. 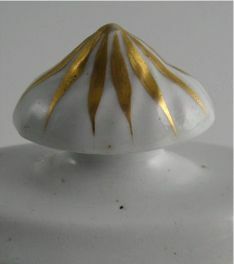 5½" (140mm) in height to the top of the cover finial. 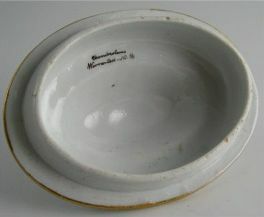 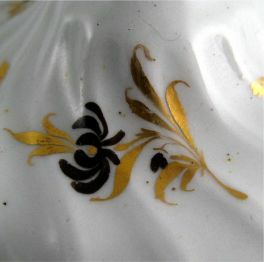 The sucrier cover has the 'Chamberlain Warranted' mark and pattern number 'No16' in black and on the base of the sucrier is the pattern number '16' in gold on the base. 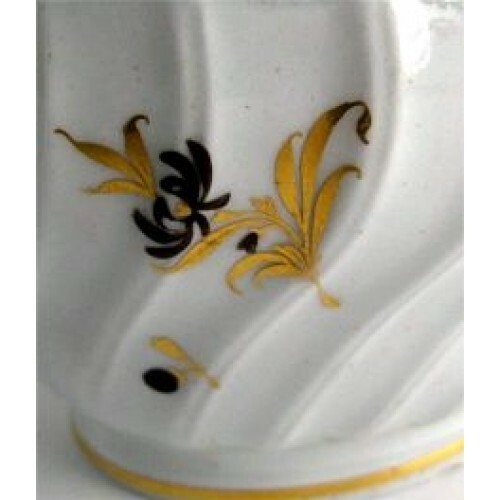 In Chamberlain's pattern book, this pattern is listed as 'plain, rose colour & gold sprigs. 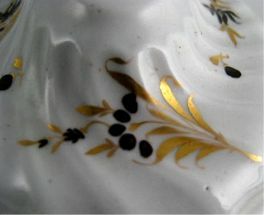 Mr H C's pattern'. 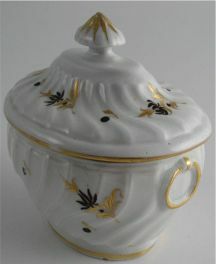 This very pretty sucrier and cover is in good condition. 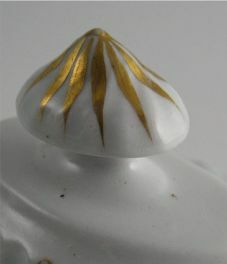 There are but a few manufacturing imperfections and a small amount of wear to areas of the gilding, as illustrated below. 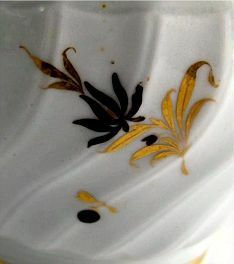 There are no repairs or restoration. 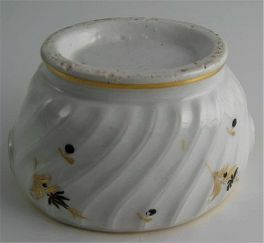 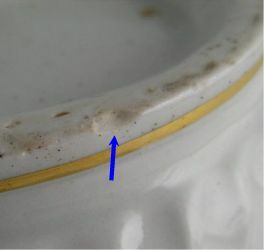 The two loop handles at either end of the sucrier have firing cracks in the glaze around the base of the loop and across it in two places, as shown by the arrows. This is a very minor and insignificant manufacturing imperfection. 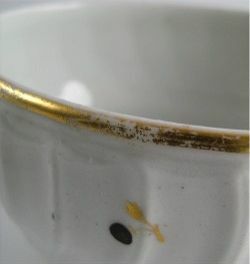 Finally, there is what may look like a few small chip to the base of the sucrier. 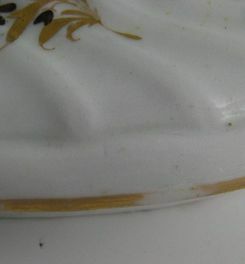 This again is a manufacturing imperfection as the chips are glazed over. 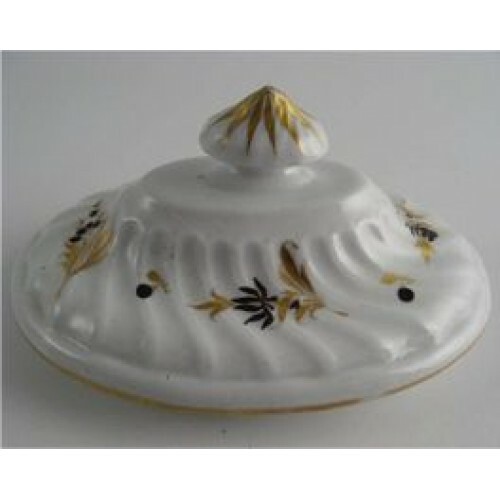 This is a very good example of a Chamberlain's Worcester sucrier and cover c1795 for the collector of Chamberlain's Worcester or eighteenth century English porcelain. 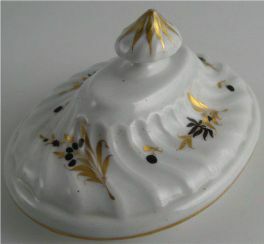 Condition (See main description for full details and pictures) This very pretty sucrier and cover is in good condition. 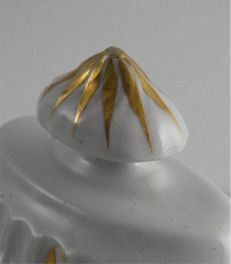 There are but a few manufacturing imperfections and a small amount of wear to areas of the gilding, as illustrated in the main description. 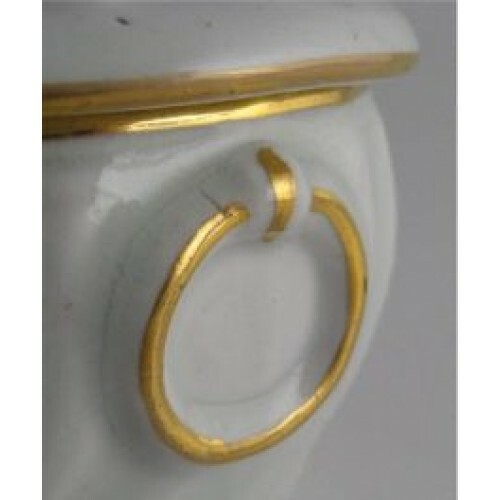 There are no repairs or restoration. 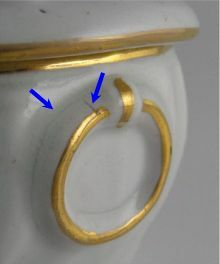 The two loop handles at either end of the sucrier have firing cracks in the glaze around the base of the loop and across it in two places, as shown by the arrows. 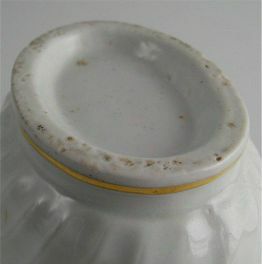 This is a very minor and insignificant manufacturing imperfection. 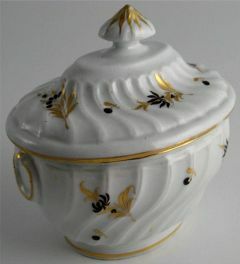 Finally, there is what may look like a few small chip to the base of the sucrier. 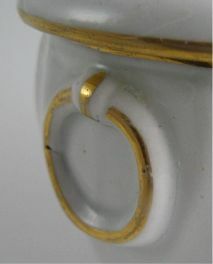 This again is a manufacturing imperfection as the chips are glazed over. 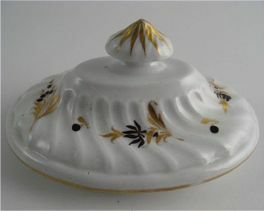 This is a very good example of a Chamberlain's Worcester sucrier and cover c1795 for the collector of Chamberlain's Worcester or eighteenth century English porcelain.